CRIME, GUNS, AND VIDEOTAPE: Now It’s Time To Slam Whitney Houston and What She Became. Now It’s Time To Slam Whitney Houston and What She Became. Beverly Hill, CA—She had it all a truly gifted voice, adoring mentors and legions of zealous fans. Incredible wealth was showered over this woman who traded everything for mind-altering drugs. 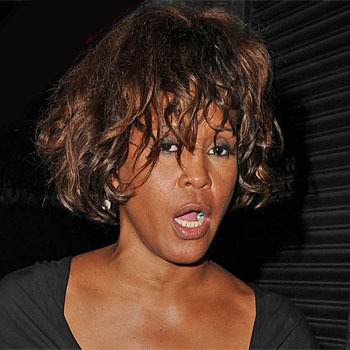 Whitney Houston managed to transform herself self-absorbed, filthy, disgusting crack whore. She maybe missed right now but by no one more than those selling illegal drugs to her. Houston was a monumental disappointment to anyone that ever helped her. We have a War on Drugs and nearly everyone engaged in that war profits from its continuation. We need to legalize the poison just to remove the obscene profits. Regulating and taxing this toxic garbage will be no improvement. I do mean legalize. At the same time we must refocus on treatment for only those who want to be returned to health. Right now hundreds of billions of treatment dollars are wasted on those in treatment for cutting jail time rather than to quit drugs. I hate drugs but I hate the violence, corruption and loss of liberty and privacy more. The Drug War has taken a huge bite out Americans Freedoms. We need to get liberty returned. As for the addicted we know that don’t seek treatment the only correct way to help them is through tough love. Feeding the addicts has never been helpful. Why slam Whitney - plenty of other children of talented and famous people end up dealing drugs and in jail. Who don't even have a short period of time - where they give the world something so wonderful as Whitney did. KFI radio hosts John & Ken have apologized for derogatory comments they made about Whitney Houston that resulted in their suspension from the station. "We made a mistake, and we accept the station’s decision. We used language that was inappropriate, and we sincerely apologize to our listeners and to the family of Ms. Houston," John Kobylt said in a statement. He hosts the show with Ken Chiampou. When talking about reports of Houston's odd behavior before her death Saturday, they said: “It's like, ‘Ah Jesus . . . here comes the crack ho again, what’s she gonna do?" The duo talked about Houston's past drug problems, at one point saying she was "cracked out for 20 years," according to a recording on the Urban Informer website. When talking about her drug problems and death, they said: "Really, it took this long?" KFI announced the suspension Thursday. "Management does not condone, support or tolerate statements of this kind," the station said in a statement. Officials are still trying to determine how Houston died. Authorities collected several bottles of prescription drugs from Houston's suite at the Beverly Hilton, where she was found dead Saturday. But officials have said the amount of drugs did not seem unusually large, leaving it unclear whether the medications had anything to do with the singer's death. Officials are waiting for the results of toxicology tests on Houston's body. The Los Angeles County coroner's office said Wednesday that investigators had asked "a number" of doctors to provide them with Houston's medical information. Not Quite The End My Friend. Drugs are not evil in everybody's case...And to which drugs are we speaking of? It ALL comes down to that persons STRENGTH OF CHARACTER, WILL POWER, DIRECTION TO GET OFF THE DRUG /OR LACK OF IT. Often true, but NOT necessarily and always true! For instance Drugs did not ruin Steve Job's life, or Dr. Albert Hofmann who lived to be 101, or Freud's! Plus the command to stay FAR away from drugs and those who use or sell them would necessarily include DOCTORS, SHRINKS, drugs stores. And some of the licensed doctors and shrinks are worse - Remember Anna Nicole Smith or the book "One Flew Over The Cuckoo's Nest" written by an insider. Anonymous said "She lost control, her so called friends got her hooked, and she succumbed. Drugs ARE EVIL. They can ruin ANYONE'S life. Stay FAR away from them and those who use or sell them. End of Story"